I have two and I love mine. One IPK and one steel. Two very different looking watches IMO. Photos (again!) below. Add approx. 8 % for a bracelet version of either one. The prices assume excellent working, but used condition, and would include box and manual, but not necessarily an original invoice or letter from CW. Prices should be adjusted accordingly for condition, extras, need of service, demand and market conditions. I no longer own it, but I had a PVD on leather. I loved everything about it except for the fake dive bezel. I was a relative late comer to the C40 club, only getting mine last October - a terrific deal from a fellow enthusiast. 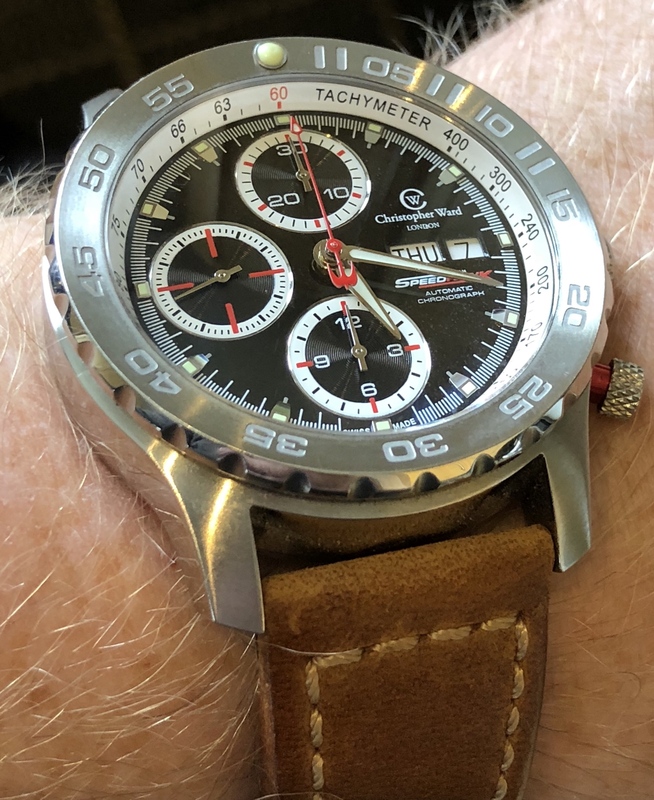 I really like the watch - the overall design, size & weight - one of CW's finest in my opinion, and something they gave up on rather too quickly. If you can get one at a sensible price I doubt you will be disappointed. Kip - where are these resale records? My research was done on the sales forum here - mainly reports of (confirmed) eBay sales. Unold items can skew the numbers considerably. Looks like my research differs considerably from yours. Love mine. Unique design imo. Be patient like me and you will get a good deal on eBay. Nice big chunky watch. Kip monitors and records CW sales privately and is a wealth of information! Since most sales are in sterling, it’s unlikely these USD quoted prices would be reliable. If the prices quoted by Kip in USD are converted using today’s fx rate they would be understated given how much the dollar/sterling rate has moved since the Brexit vote. If the individual sales were converted using an fx rate applicable at the time of sale, the average would be overstated. Does anyone else wish the bezel was countdown instead of up? With 50m WR the manual says no more than a shower, and it already has a chronograph counter. I wish it was a countdown like my Alpnach, making it a better field watch. I loved my PVD though. 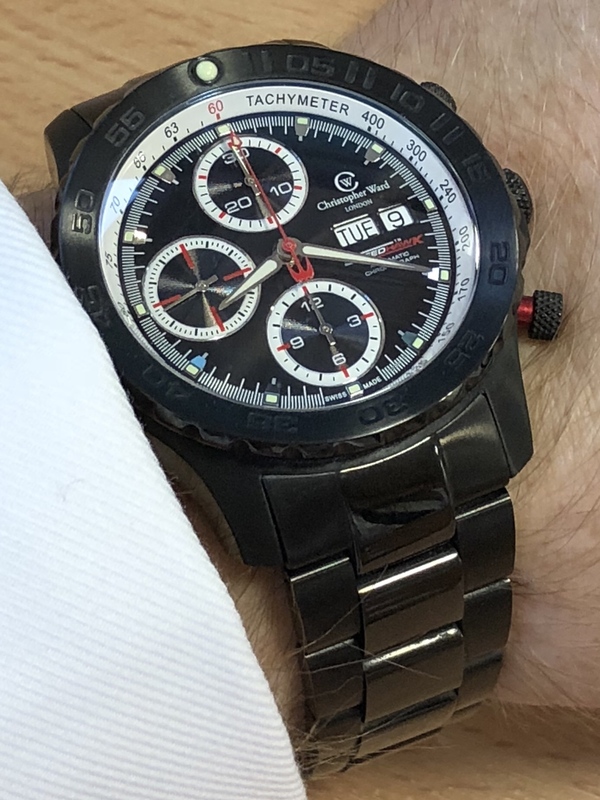 The red accents were awesome and the dial was just mesmerizing. As Smegwina stated, I track CW resales from many sources including many forums, resellers and EBay world wide. I have tracked almost 11,0000 sales over the past 14 years. The records are not currently published but I am working on it. Dollars are entered/converted at the exchange rates on the day of sale. Long term I feel that things tend to average out. Kip, would you mind sharing your data for the IPK please? I mean your source data. The details of the 17 individual sales. I’d like to add them to my own so I can come up with a fair second hand price for a C40 IPK. It would be much appreciated. Thanks for that Kip but I was actually hoping for details of the 17 IPK unit sales that are contributing to these measures. You see, I have offered a colleague a certain amount for his Speedhawk based on sales inf I can find in the sales corner here. If I should be offering more in order to become CW owner, I’d really like to enhance my own analysis with your additional base data.